Nice and bright, quite soft, dark cherries and blackberries, nice extraction and classic expression. Soft and fresh but plenty of flaviour, high mineral and acidity, pure and crisp, tight and light but approachable and with character. Good lines, plenty of time for it to open up. 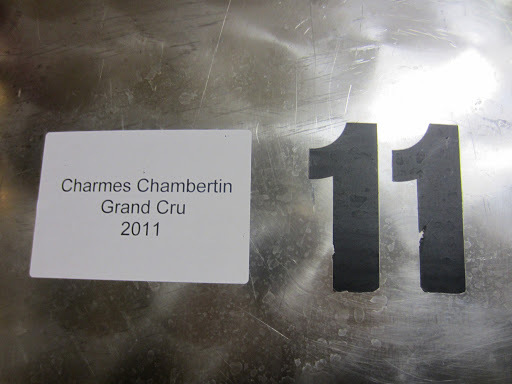 More rustic and Nuits nose, more earthy density and masculine concentration, led bright and fresh characters. Light bodied, good freshness but a lot more savoury elements than the previous wine, nice concentrated firm tannins without too much weight or astringency. More refined and elegant, slightly more floral elements on the nose, not extractive or over-ripe, bright but not exuberant, more assured. Well balanced and integrated, a little closed at the moment, dense and more on the mid-palate, still very soft and supple, but will develop very interestingly. A little brighter and more intense on the nose, good fruit but also savoury earthy green notes, nice powerful masculine aromas. Wonderful finesse and drive on the front and mid-palate, freshness and brightness of fruit, but builds on the palate and kicks in with tight concentrated tannins quite late. Very complex and will continue to evolve over a longer period of time. Darker and certainly spicier and earthier, denser with nutmeg and some rosemary notes. Lighter but a lot less voluptuous and soft, bolder and fuller tannins, dense concentrated robust masculine characters. Extremely subtle, very locked away. Wonderfully dense and complex, builds and evolves across the palate, refined yet mature tannins, structure balance and exceptional integration, a little full on tannins at the moment but it is far too early for this wine. Dark soft round fruit, rich and inviting but also precise. Dense and straight through the palate, delicate and fresher, tight structure but not as heavy and bold. A finer style, much more my preference. Wonderful balance between freshness fruit acid tannin.